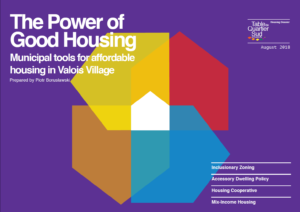 This document proposes various methods for increasing access to housing in the Valois Village. The suggestions are inspired by successful practices elsewhere, and are meant to encourage a holistic approach to quality affordable housing implementation. Our policy recommendations are designed for the Valois area, but can also be applied across the city of Pointe-Claire and the West Island.